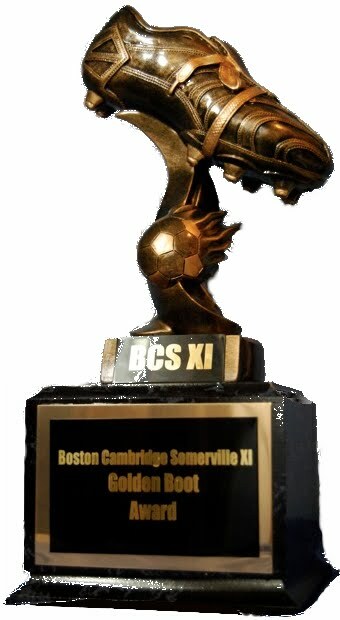 BCS XI bounced back from their first loss of the season in convincing fashion, easing to a 6-0 victory over third-placed Inter Boston FC on a sunny afternoon in Waltham. BCS moved two points clear at the top of the table, although Ballers have a game in hand. The home team started brightly and created the game's first chance just ten seconds in, shooting wide from the top of the box. It would prove to be their best chance of the half, however, as strong defensive play from the BCS back four ensured that Dave Doucette's goal was rarely threatened. When Inter did manage to get forward, Dave controlled his box well by claiming high crosses and making several comfortable saves. BCS soon settled into the game and opened the scoring on 15 minutes. Paul, fresh off last weekend's brace, continued his good form by powering a header just inside the far post. The goal seemed to boost the visitors' confidence, and they began to stream forward in numbers. Fran forced a couple of good saves from the Inter keeper, then Joe was sent through but couldn't finish from a tight angle. As halftime approached, Ramo used good footwork to beat several defenders on the left wing before crossing to Fran, who powered his shot home from eight yards out for a 2-0 halftime lead. The second half saw more of the same, with the warm temperature and calm possession by BCS seeming to wear down the home team. Playing with a deep sweeper, Inter provided the BCS strikers with plenty of space to turn and run at goal. The result was four more goals and a slew of chances. First, Ramo finished at the near post following a beautiful cross from Joe. Then, Andy Vesper pounced on a rebound from Fran's free-kick which had crashed off the crossbar. Joe added the fifth BCS goal before Fran completed the scoring with a calm left-footed finish at the far post. It could have been more, with Andy Hoot in particular unable to find his scoring touch from six yards out, but in the end the BCS players and coach were pleased with the result. The Eleven return to Dilboy Stadium next week for a match with Acapulco FC, while Inter look to rebound from their loss in a match against fourth-placed Coastal United FC.